The Holiday Season is upon us. Up here in the Pacific Northwest, the rains have set in, coloring the skies grey and generally making things cold and damp. Daylight hours are still waning, and many of us wake-up in the dark and don’t get back home till the sun has set. To balance this, we light candles, make/eat cookies, decorate our homes with lights, and host/attend numerous celebrations bringing the light of friendship and family into our homes and hearts. But sometimes that is just plain hard. Maybe we are tired, worn-out, over-stimulated, already feeling the effects of the darker days, or we are dealing with difficult personal stuff; but whatever the reason, the “Season of Joy” might be our “Season of Challenge”. And this is where yoga can once again support us. In order to connect with others, we need to be able to open our hearts and connect with ourselves. Backbends do just that, through physical forms we touch down into emotional spaces. Yoga is full of backbends. Some are super dramatic, like urdhva dhanurasana (full wheel), ekapada rajakopatanasana 4 (full pigeon), others are more subtle, like Warrior I or cow pose. Regardless of the depth of the pose, backbends are incredibly nourishing. Not only do they bring healing to the spine, but also they re-engergize the body as we open up the spaces around the heart. They help us to breath more deeply, and with greater ease, allowing us to more fully oxygenate all the organs in the body. At a deeper level, backbends ask us to expose our hearts, open to vulnerability, and explore the edges of our fragility. And in doing so, we find the spaces within, from which we can draw the strength to love more deeply and give more freely, and not just to other, but also to ourselves. In order to derive the greatest benefit from backbends, it is essential to know how to do them safely. Join me for an afternoon that is certain to inspire and nourish. 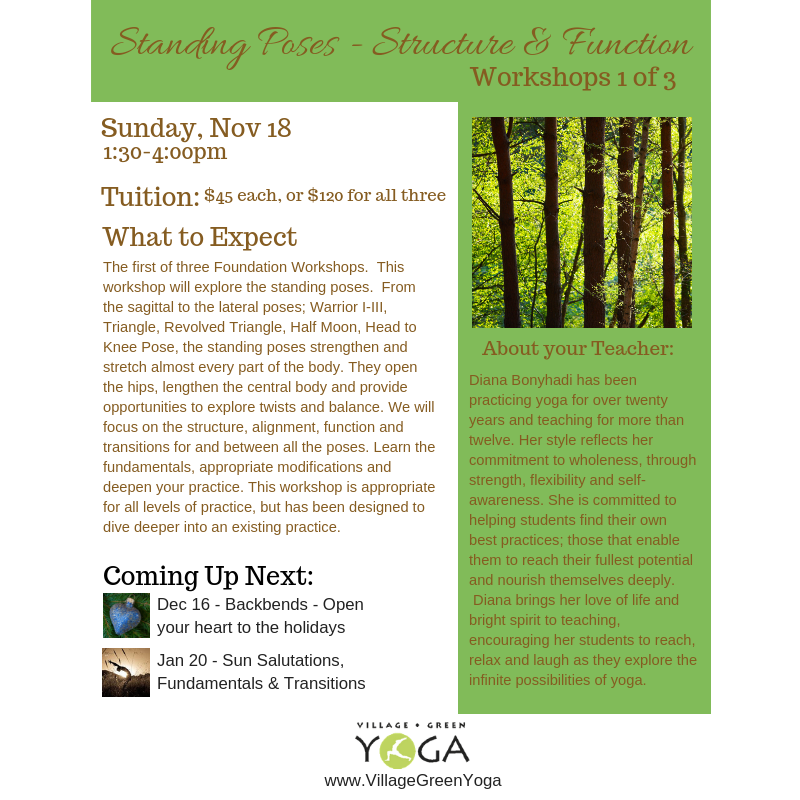 I’m pleased to announce that on November 18th, I will be hosting a workshop on the fundamentals of the standing poses. Of course there is more to standing poses than just placing your feet appropriately on your mat and doing something with your arms. Standing poses are an opportunity to stand firmly upon the earth and open to the spaciousness within. Finding the correct physical alignment for your body will also allow you to find your own internal alignment with yourself. When your poses are no longer a struggle, opening to the peace within comes more easily with each and every breath. Join me for an exploration of the architecture of the poses that allows us to stand firm and tall and strong and calm. The response to my post and newsletter two weeks ago was incredibly supportive and affirming. I guess I am not the only one who has been trying to figure out how to navigate these challenging times. Thanks to all of you, I not only feel comforted but also inspired to continue to teach yoga from my space of satya (truth). Now when I listen to the news, I realize that there is something more that I can do other than make phone calls, sign petitions and march. And I have been doing it all along – teaching yoga and helping people to find a space of inner peace and strength to follow their own path of Dharma. We have made a slight change to the schedule at River Tree Yoga. On Wednesday evenings I will only be teaching one class at 6:30pm. It will be a Hatha-Yin Fusion class. We will go slowly and deeply into our poses, look to alignment and strength, and finish with some long luscious yin holds to restore and rebalance our energy. Other news at River Tree Yoga, we have a Yoga Sound Bath with Daniella White scheduled for Tuesday February 28th at 7:30pm. If you haven’t gone to a Sound bath yet, you really should. Imagine a gentle yoga practice followed by a nice, long svasana and being lulled into a deep state of meditation by crystal singing bowls, vocal harmonics and gongs. Participants are bathed in powerful vibrations that help entrain their brain waves into Theta. It is in this deeply relaxed state that physical / mental / spiritual healing can take place, activating the parasympathetic nervous system, cellular regeneration, stress release, and emotional/physical healing. Click here to register. Speaking of Gratitude, I will be teaching a Gratitude in Motion class at River Tree Yoga this weekend (Saturday @ 9:00am) to support Yoga Behind Bars (YBB). WBB is an amazing program that brings yoga to incarcerated persons throughout the state. The power of yoga and meditation to bring healing to our bodies and spirit has been proven time and again. It is my firm belief that yoga should be available to all persons regardless of their life circumstances, or maybe especially in regard to their life circumstances. To this end, I have made a commitment to not only offer this Gratitude in Motion class but also to serve as a volunteer teacher for Yoga Behind Bars. Inga and I thank you in advance for your support. Suggested donation of $20.00. The shoulder joint is one of the most dynamic joints in the human body. It is also one of the joints most prone to injury. Learning to set the shoulders properly for stationary and moving asanas will make the difference between damage or health in your yoga practice. Join us for a workshop dedicated to helping you find strength and support in your shoulders in a wide variety of yoga poses, including: plank, chaturanga, downward facing dog, shoulder stands, and backbends. We will conclude with a long nourishing restorative practice. Workshop is appropriate for all levels and bodies, even those already suffering from shoulder or neck pain. $40.00 early bird discount, $45.00 after December 1st. Hug your Friends & Family. This is a bit of a late notice. I meant to get this announcement out before I went on vacation, but it just didn’t happen. Oh well, as it is, I am restricting the class size on this workshop to ensure super personalized attention, so maybe it is a good thing if every body can’t make it. I will be hosting a workshop at River Tree Yoga which I have been planning for quite some time and am super excited about. Do you have pain in your knees, hips, shoulders, back? For those of us who have played hard throughout our lives and have at some point or another sustained some form of injury that seems now to limit our mobility or enjoyment of movement, this workshop is for you. Learn how to modify your yoga practice and adjust your asanas (postures) to ensure safety, reduce pain and maximize benefits. When you sign up, you can even let me know your specific injuries so that I can be sure to address them in the workshop. This workshop is appropriate for all bodies and all levels. Cost is $40 before March 12, and $48 after. Please contact me directly to sign up. There are still a few spots left available for the Sun Salutation Workshop this weekend. Sign up now to reserve a place for your mat. Sun Salutation – Surya Namaskar is nothing less than a prayer to the sun, the earth and all that is in between. As we move through these poses we nourish the body and spirit in deep and powerful ways. This sequence of 8-14 poses can be found in its entirety or separately in almost every yoga class. If you have ever wondered how to step fully into and through each of these powerful poses, then now is the time to learn to own them, enjoy them and truly benefit from them. This workshop will focus on the elements of alignment within the poses, techniques for transitioning between the poses and the role of the breath throughout the poses. The workshop is suitable for all bodies and all levels. Learn how to modify and adapt the poses to ensure safety, and enhance your practice. Call early to reserve a place for your mat.